This serene ring was inspired by the majesty of waves crashing into the shore and flowing back out to sea. 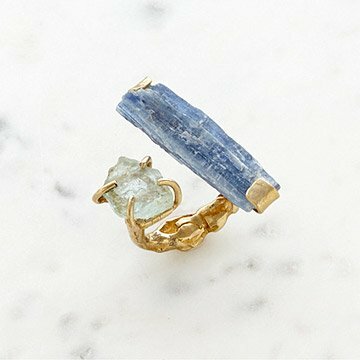 Inspired by the majesty and sheer power of a flowing waterfall, Emilie Shapiro’s captivating kyanite ring evokes the breathtaking natural beauty of this moving sight. Handmade in Brooklyn, New York. Make it a set! Pair with the matching necklace and ring.Handmade in New York City. Take a studio tour to see where Emilie Shapiro creates her handmade jewelry! Clean with a damp cloth or with mild detergent and a soft brush. Love the stones and design of the ring. I might take it into my workshop and see if I can alter the angle of the light colored stone to be more upright when looking straight down on it. This ring is beyond words.. the artist has sculpted gorgeous crystals and stones into a unique design. I receive compliments everywhere I go, even from a stranger. I love the detail and use of textures against one another. The work the artist put into this using very good metals is beyond compare. I would like to see more from this designer in the future.